Woho! You have a nest box full of newborn baby rabbits! But wait… how are you supposed to pick them up and handle them? 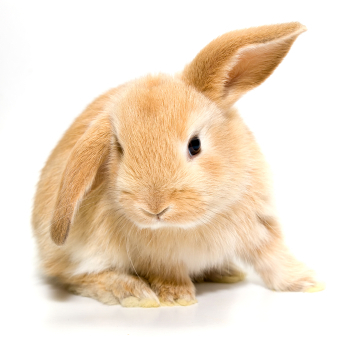 Some people will tell you that you shouldn’t touch a baby rabbit or the mother won’t come back and feed them. While this is true for wild rabbits its total baloney for domesticated rabbits and you, as a responsible rabbit parent, need to be checking on your kits (the technical term for newborn baby rabbits) every day. Their mother is very accustomed to your scent (you feed her every day, right?) so will not reject her babies just because you touched them. - Handle gently, these babies are very tender and fragile during their first few weeks of life so don’t be rough. - Make sure you keep a snug grip on them though. You will be amazed at how quickly a kit can squirm right out of your hand if you’re not paying attention. I like to cup them in the palm of my hand and then form a “cage” around them with my fingers so they can’t wiggle out. - You might get peed on, don’t worry about it. But keep a paper towel handy for clean-up. - If mama-rabbit is being cranky either remove the nest box from her cage so you can look over all the babies OR come back later when she’s calmed down. 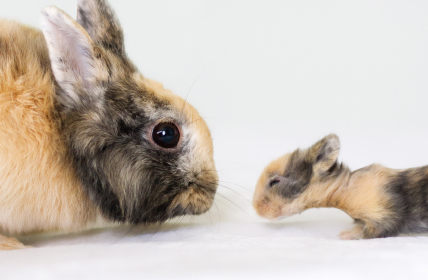 Rabbit moms can act very protective around their young but most will take a more laid-back approach after a few days of you coming in and checking on things. Keep reading about your babies and how they will grow here. 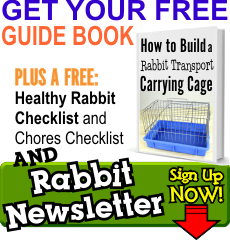 For an in depth guide to breeding and raising rabbits be sure to check out our Amazon book, How to Breed a Rabbit and we’d also love for you sign up for our newsletter (if you haven’t already) so that you can stay up-to-date on other great rabbit info that will help you become a better bunny owner!